Grange House has had a consecrated chapel since it was added by the then new owner Francis J Mitchell in the 1860s as part of a large programme of extensions. The chapel was built into the existing building on the east side with three sharp gables and a rendered exterior. From the outside it appears unassuming but as you enter through the small door in the hall, the series of intricate stained glass windows bring light and colour into this intimate and calm space. 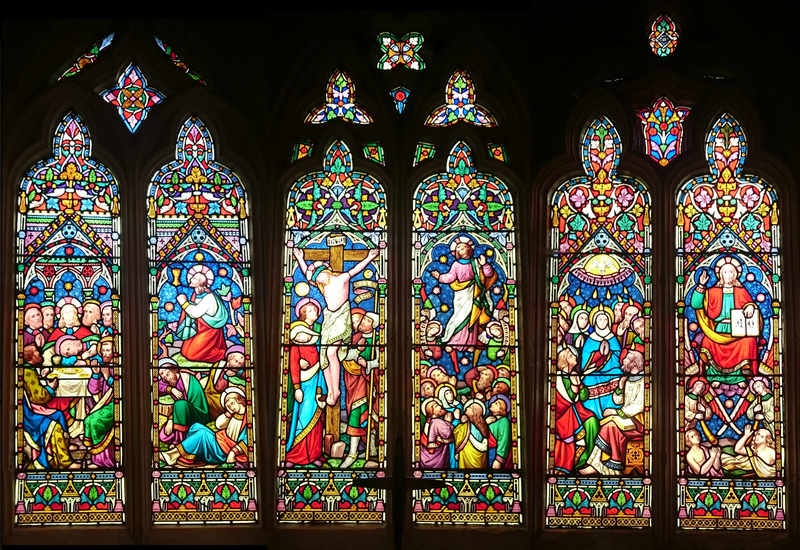 The chapel windows tell the story of Christ from the Nativity to the Last Judgement through ten panels, and were designed and made by William Wailes (1808-1861) who owned one of England’s largest and most prolific stained glass workshops. Born in Newcastle Upon Tyne, William studied stained glass production in Germany, returning to the UK to set up his design studio in 1838 and produced his first glass in 1841. 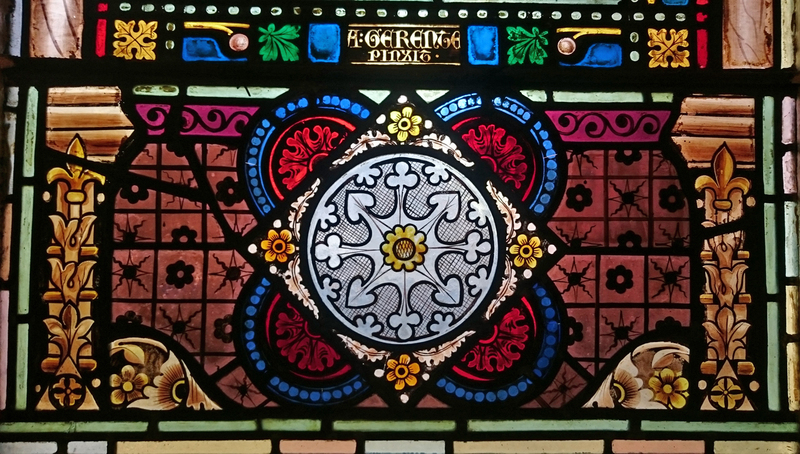 One of the twenty-five stained glass manufacturers that exhibited in the Crystal Palace Exhibition in 1851, Wailes was seen as a ‘Gothic Revivalist’ and his company at its height had 76 employees. He produced windows for A.W.N. Pugin (Palace of Westminster interior designer). His work can also be seen in Aberdare, Merthyr Tydfil, the west window of Gloucester Cathedral, numerous houses and churches in Wales and England, and as far afield as Philadelphia, USA. The chapel would have first served the spiritual needs of the resident families, and then the staff, patients and residents of Llanfrechfa Grange as its use changed over the years. Present-day staff remember the chapel being used for funerals of former residents and for memorial services. 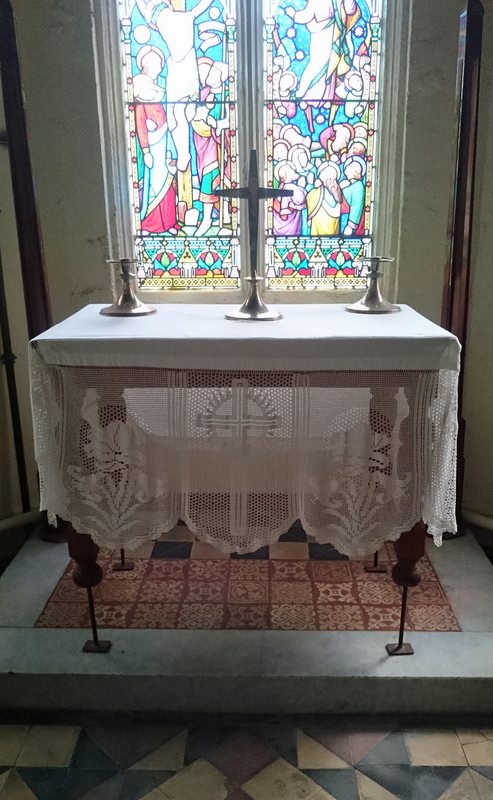 The chapel is still active as a spiritual centre for the Llanfrechfa Grange site, celebrating Easter and Christmas, and providing a quiet corner for contemplation. 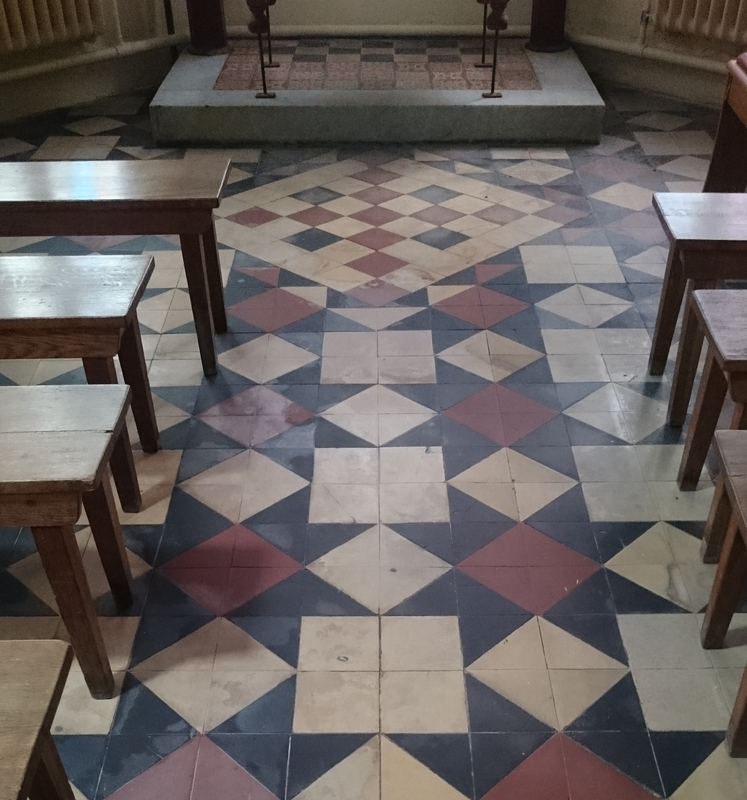 Chapel floor design. © S. Goodey 2017. Detail – chapel floor design.© S. Goodey, 2017. 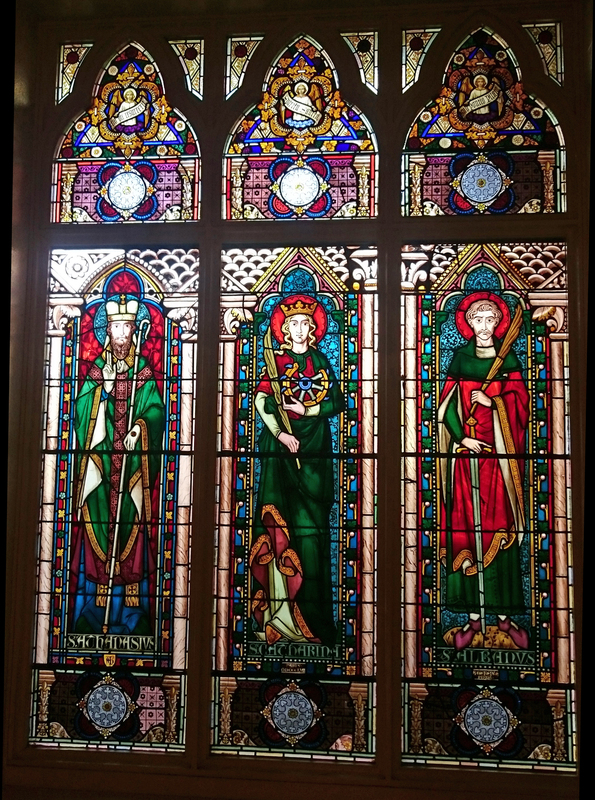 Another stained glass feature that was installed in Grange House is the panel of three saints set above the main staircase. The staircase itself is dated at (c1848) and the glass is signed and dated ‘A Gerente, Paris 1857’. Alfred Gerente (1821 – 1868) was born in Paris, and designed glass for buildings in France, England, Germany, Spain and the United States. 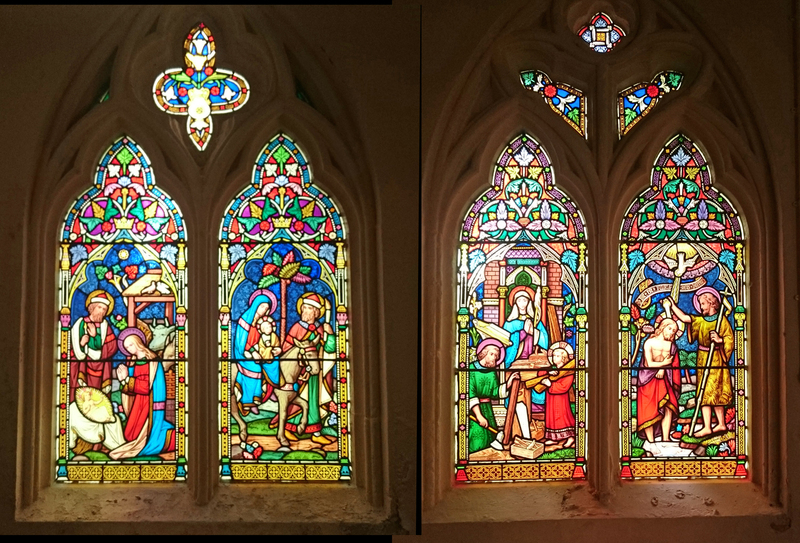 Chapel staircase windows depicting three saints. © S. Goodey, 2017. Detail of staircase window showing signature and date. © S. Goodey. Do you have a memory of the chapel that you would like to share? If so, please get in touch.